I am extremely grateful for the blessings in my life...for the people near and dear to me...and for the gift of Living Food! 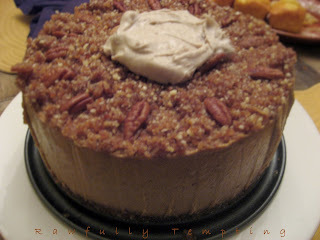 This Pumpkin-like Cheesecake, along with the amazing Frosting added a sweet bit of bliss to an already perfect day! 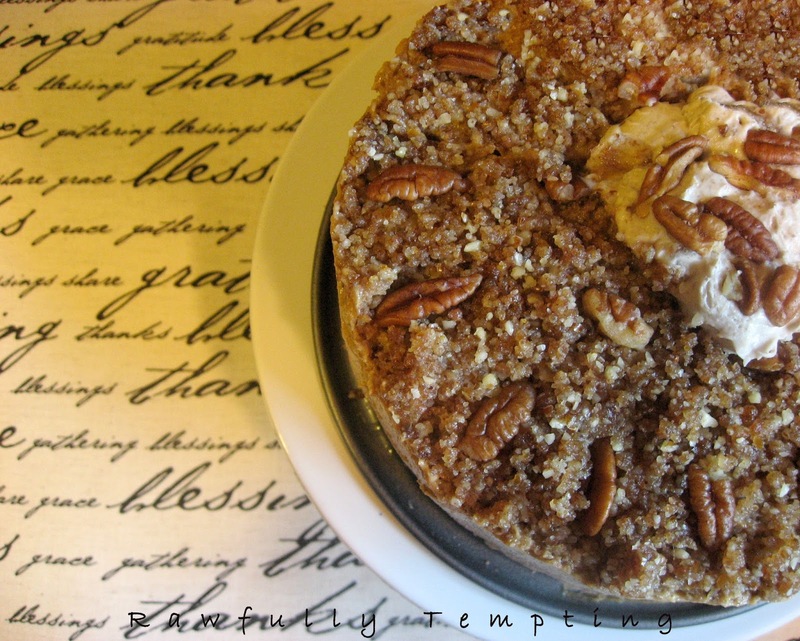 This dessert has been enjoyed by ALL sorts of foodies! While I didn't get this out on time for Thanksgiving...here it is for the upcoming holidays and New Year! 6 Tablespoons white chia seeds -dark will darken color, but can be used. 1. In food processor, blend nuts and dates. Add extract and salt and process until it starts to clump together. 2. Press mixture into 8 inch spring form pan and set aside. 1. If using Hachiya persimmons, they must be very ripe. 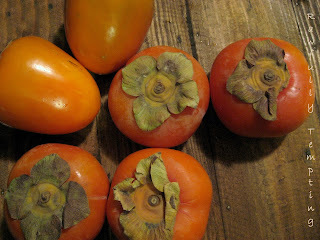 I like to mix them with Fuyu persimmons. 2. Scoop out pulp. Remove any seeds. 3. In blender, mix persimmon pulp, banana, Irish moss paste, chia and cashews until creamy. 4. Add extract, maple syrup, water and lemon juice. Use Vitamix tamper if mixture is very thick. 5. 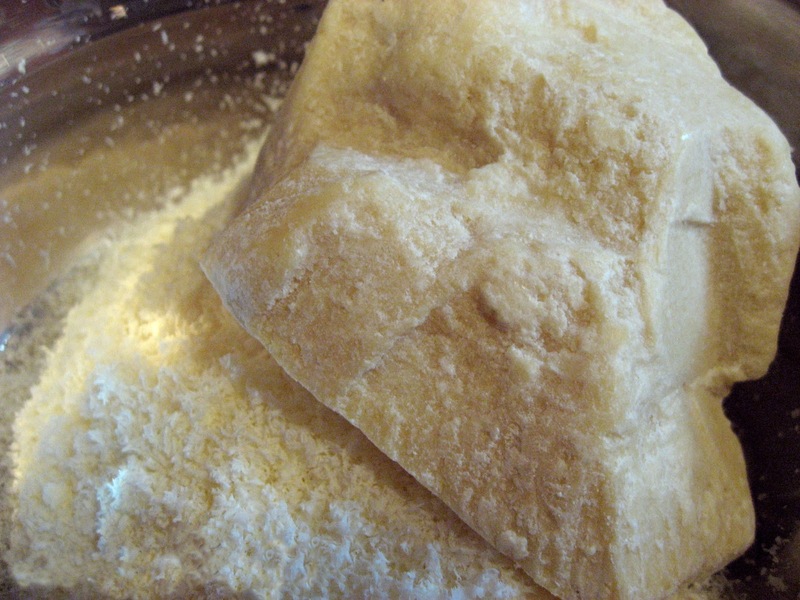 Add lucuma and seasoning. Melt cacao butter and coconut butter in a metal bowl over another bowl filled with hot water. Add melted ingredients to blender. 6. Taste for sweetness. Add psyllium husks powder. Blend and quickly pour mixture into oiled spring form pan. Psyllium causes mixture to set quickly. 7. Tap on counter to spread batter evenly in pan. Sprinkle top of cake with Crust Mixture. 8. Refrigerate for several hours or overnight, until chilled. 9. 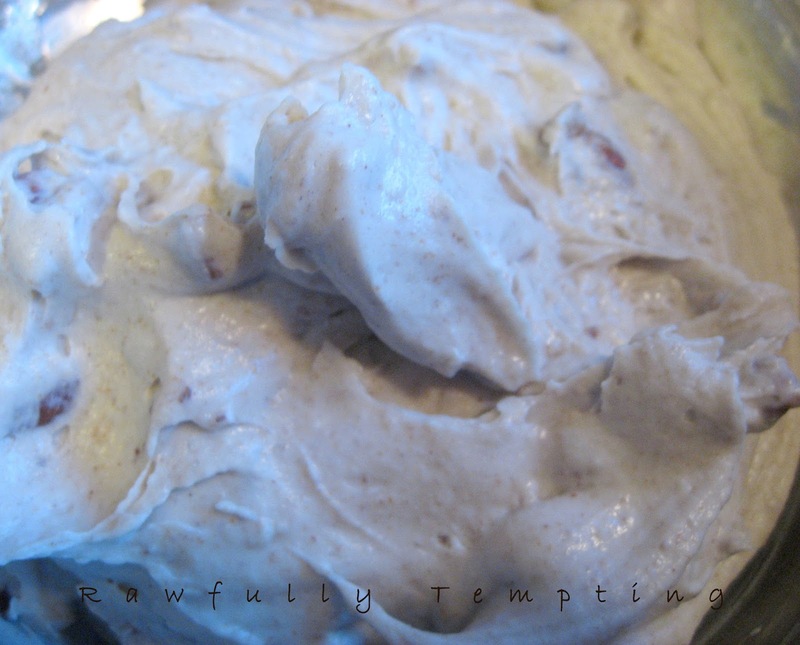 Garnish with pecan halves and dollop of Coconut Creamed Cheese Frosting. 10. Option - Freeze cheesecake for several hours until firm. 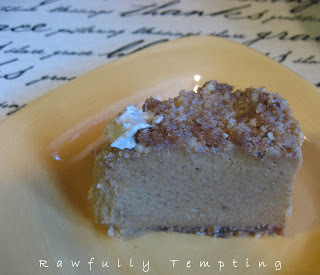 Frost top of cake with Coconut Creamed Cheese Frosting. Garnish with pecan halves. 1. In blender, mix coconut meat and water, cashews, lemon juice, maple syrup and chia. 2. Add lucuma, extracts, and sea salt. 3. Melt cacao butter and coconut butter in a a medium bowl, placed over a small bowl filled with hot water. 4. Add melted ingredients to blender and mix until creamy. Transfer to bowl and stir in chopped pecans. 5. Chill in refrigerator for several hours, or quick chill in freezer, until stiff. 6. Use a decorating bag and tip, or dollop onto dessert dishes. 7. Store in refrigerator for up to 4 days.